A team of area college students was named Grand Winner in a national competition to design an energy-efficient affordable house based on the median family income of the area. Students from ESF, Onondaga Community College and Syracuse University took top honors in the Challenge Home Student Design competition held in Boulder, Colo., and sponsored by the Department of Energy (DOE) and the National Association of Homebuilders. The team, which called itself Montage Builders Northern Forest, won the grand award in the single-family detached home category for its Craftsman-style, sustainable design. "We were the only team that took on the challenge of working across institutional boundaries, and the judges and other teams all commented on our truly integrated approach to solving the challenge," said Paul Crovella, an instructor in ESF's Department of Sustainable Construction Management and Engineering. 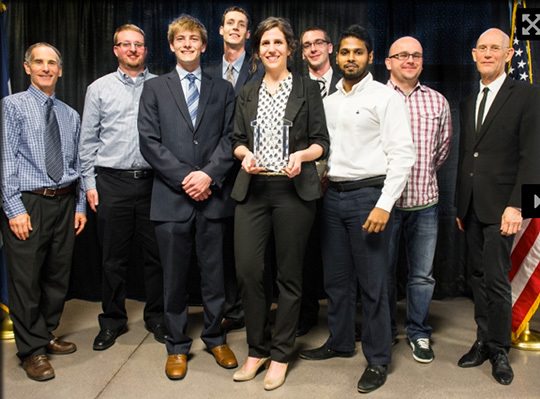 "Bringing three schools together was the key to our success in our competition and also our design," said team leader Michelle Tinner, an ESF graduate student. For the multicollege group, the goal was to design a home with an extremely energy-efficient shell that has the potential to be turned into a net-zero building. "This team developed an adaptable, accessible Craftsman-style design that embodied responsible … (and) sustainable redevelopment of an existing community in Syracuse … that was buildable and appealing," stated the competition judges' evaluation of the Montage Builders design. "If the owner wanted to put a photovoltaic or other alternative energy system on it," said Crovella, "it could be completely self-sufficient for energy." Another aspect incorporated into the design was "visitability," said Tinner. "This allows people with various physical abilities to enter the house and take part in cooking a dinner and have all their needs met in all the house." Such a design includes wide doorways, zero-step entry and accessible bathrooms, said Tinner, who is studying sustainable construction management. The median income in the Syracuse area is $65,000. Based on mortgage guidelines, that gave the team a budget of approximately $190,000. The DOE has long sponsored a Solar Decathalon geared toward architecture schools to build a structure based on solar energy. That international competition requires millions of dollars in fundraising and the technologies used are often two or three steps away from what can be done today, said Crovella. "It's very forward searching." Challenge Home Student Design looked for "the sweet spot" between the best of the technology in a format that can be easily implemented by today's builders. "It's more practical," said Crovella. The team competed against 30 schools nationwide including past winners of the Solar Decathlon. Montage Builders submitted its design at the end of March and made its presentation at the National Renewable Energy Laboratory in Golden, Colo., in April. The weekend-long event included the 20-minute presentations along with technical sessions. Mary Thompson, executive officer of the Home Builders and Remodelers of Central New York, who has worked with Crovella's students in the past, offered her congratulations to the group adding, "We look forward to having these students as future members."